Saul Lubaroff began his musical journey at the young age of eight years old studying piano in Philadelphia. By the time his family moved to Iowa, Saul had been playing viola for a year and later switched to Clarinet in the 5th grade. In 7th grade Saul’s love of jazz took over, and he added saxophone to his arsenal of musical instruments. By the age of 13, Saul began studying jazz improvisation, attending summer band camps, and taking private lessons. Saul organized his own combo at the age of 16 and played his first gig at the Hillel House. He studied with Dan Yoder, The jazz studies director at the time at the University of Iowa. Saul was playing in big bands before he was old enough to drive a car. 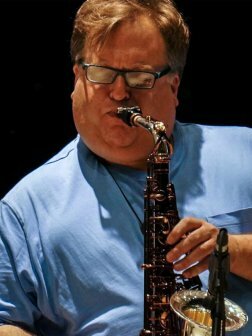 Excelling as a saxophonist, clarinetist and flautist, Saul is a great cog in the Eastern Iowa Music scene. Performing with his own jazz group deftly named The Saul Lubaroff Quartet, Saul has 2 CD's available on I-tunes, Amazon and other digital music providers on the internet. As an accomplished free-lance woodwind artist, Saul has played with Orchestra Iowa in the woodwind section for world famous entertainer Bernadette Peters. You will often spot Saul as a sideman with The Bernemann Bros band, Brass Transit Authority, The Tanya English Band, James Mons and his Not So Little Monsters, The Nic Arp Band and basically who ever calls him for a gig! Saul is a full-time member of The Fez - Eastern Iowa’s Premier Steely Dan Tribute band, a 29 year member of the powerful soul band Shade of Blue, a 25 year member of the Johnny Kilowatt Band as well as subbing and free lancing with many wonderful bands and musicians around the Midwest. In 2009 a lifelong dream was fulfilled by travelling to NYC and playing at the Knickerbocker jazz club in Greenwich Village with jazz pianist Michael Wolff and his Trio with Victor Jones on drums and Ben Wolf on bass. In 2013, Saul journied to Chicago to perform with Michael's touring band with Mike Clark on drums (of Herbie Hancock’s fame) and bassist Jeff Berlin. When travelling, Saul always brings his horn. He has been spotted in Madison, WI with local Latin jazz king Tony Castenada as well as in Santa Monica, CA for a jam session at Harvelle's by the ocean. In 2012, a session in Old Town Philly with jazz sax hero and college friend Anibal Rojas was where he met Jill Scott’s bass player. Saul maintains a local teaching studio, and in his spare time Saul spends time with his wife Georgia Black who is the love of his life. Saul also has two amazing sons Zane and Will who are the light of his life.